Teaching our children to fish is crucial if we want to sustain the success of the sport for future generations. Time spent on the water is more about bonding and teaching life lessons than catching fish. I have successfully passed on my love of fishing to my children. They now constantly say “Let’s go fishing!” or “When are we going fishing?”. I’ve opened up a can of worms, but I have no regrets, it puts a smile on my face every time I hear those words. Below are my tips for getting your children interested in and excited about fishing. Be a Hype-Man. Start a conversation about fishing in the days leading up to your trip. Use positive phrases like “Are you super excited about our fishing trip on Saturday?” or “Which bait are you going to use first?”. If you have positive fishing memories with them, bring those up as well. “Do you remember the time you caught that giant bass”? Always take kids to a location you have fished before. A good start would be introducing them to the same places you fished growing up. If this is not an option, pre-fish the area yourself prior to your trip. This way you are familiar with the best spots that hold the most fish and have experience with the bait and techniques that work well. Use a Deeper START fish finder to locate fish if you are fishing a new location. It is the quickest and most effective way to locate any species of game you target. Have everything prepared beforehand, that way you can hit the water immediately upon arrival. Kids that are new to fishing will start to lose interest fast, so avoid tying on hooks, sinkers, bobbers on location, while they are waiting. 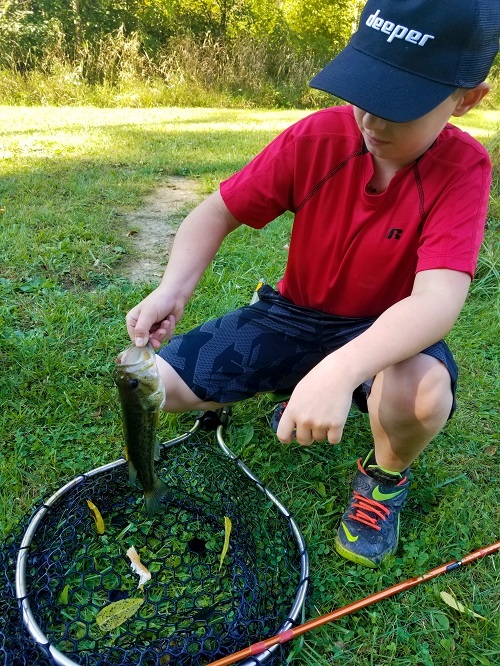 Taking kids fishing is very similar to taking them to the zoo, pack the same supplies you would for any outdoor activity: sunscreen, water, snacks, toys, bug spray, hand sanitizer and any other special thing your kids might want. Depending on the kids’ age and skill level, a good basic Spincast rod and reel combo will work best. These types of reels are great for learning how to use and will cause the least amount of line twist ups. Hard tackle boxes work best for kids, and can also double as a seat. Try to target small ponds. The fish are much easier to locate because they tend to group together more. Private ponds are always the best due to low fishing pressure. When public areas are your only option, look for ones surrounded by trees or in a valley, this will help minimize the amount of wind. “Walk though” the steps of catching both big and small fish. Have them fully understand what reel drag is, and why it is important. An easy way to do this is by wrapping your finger around the end of the line and pulling some out, simulating what a bigger fish would feel like. If you do hook a larger fish, I like to hold the bottom of the rod slightly to help keep it stable. This also puts you in the perfect “coaching” position to let them know when it’s a good time to reel in or a good time to let the fish take drag. If you have a very young child, take the treble hooks off some lures, and just teach them how to cast by themselves. My daughter smiles and laughs after every time and she’s done hundreds of casts. Bait selection is also very important component. Stick to live bait if that is available. Night-crawlers and minnows will catch a wide variety of species, so start there. Make sure you have the correct hook size for the species of fish you are trying to catch. Berkley Gulp makes a great alternative when live bait is not an option. If you want to go the artificial route, start with small lures and slowly work your way up in size. Something that is also very important is giving kids the freedom to do alternative things to fishing when taking trips together. My kids love to fish, but they also like to take breaks to play and explore. I find it very beneficial for them to also enjoy nature and grow an appreciation for the outdoors. 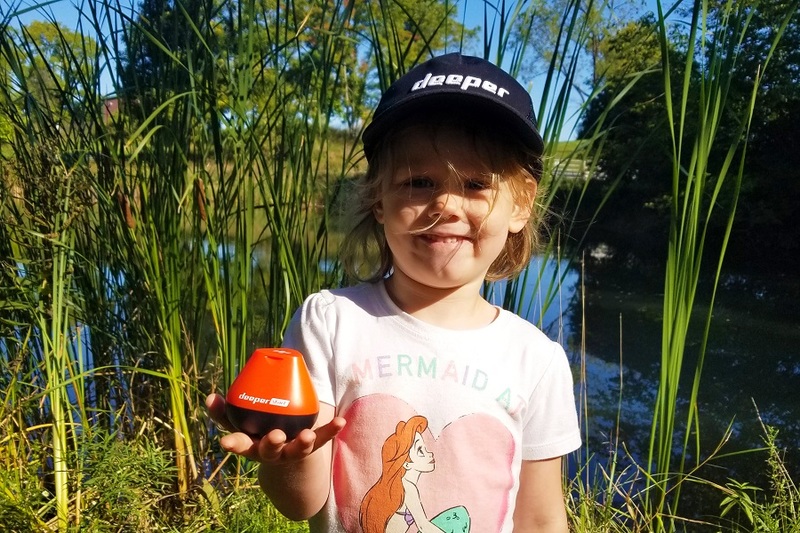 My kids also love to partner up using the Deeper START Fishfinder. One likes to monitor the Deeper app while the other one casts and reels in the unit. My kids also like to “take all the credit” when we do catch a fish, because they were the ones that found them. Bonding and spending good quality time with my children is the most important thing to me on our fishing trips. It’s a great opportunity to have a conversation with each other and learn more about their developing personality. If your son or daughter really shows interest in the sport, start incorporating fishing into everyday events. I let my son pick out 1 new fishing lure every time we go to the store. Playing fishing video games and watching fishing related television shows is frequent in our household. Once a month we all organize our tackle boxes together, sometimes trading lures with each other. If you point out things in everyday life that parallels fishing, soon your children will do the same. Some of my best memories I have as a child was fishing with my parents, and I hope to pass this tradition on to my family. One day your kids may repay the favor and teach you some of their tips and tricks. Next Post What happened to the lost Deeper Sonar?